A NUMBER OF cheques sent to Ryanair passengers affected by cancelled or delayed flights have bounced. Several people told BBC News their banks had returned the cheques because they were unsigned. Some customers said they were charged extra fees by their banks as a result. Ryanair has apologised, saying “a very small number of cheques” processed in July were issued without a required signatory “due to an administrative error”. In a statement, the airline said the cheques had been “re-issued to customers along with a letter of explanation” on 15 August. “We apologise again for any inconvenience caused to customers,” the statement added. Hundreds of flights across Europe have been cancelled by the airline in recent weeks due to strike action by pilots in several countries. 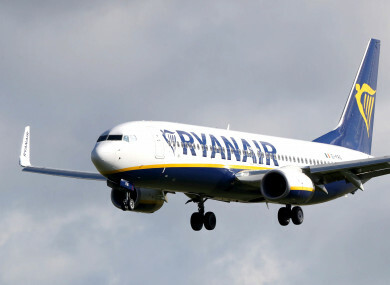 Unions representing Ryanair employees have written directly to the airline’s shareholders urging them to put an end to the ongoing industrial dispute. In a letter seen by TheJournal.ie, a statement made on behalf of a number of European unions urges the shareholders to “find a peaceful resolution for the current employee unrest”. The dispute among Irish pilots centres around working conditions and how Ryanair organises transfers of its pilots between bases. Email “Ryanair apologises after compensation cheques bounce ”. Feedback on “Ryanair apologises after compensation cheques bounce ”.